When you know all of the secrets in Star Fox and play it really well the game will send you to harder stages. 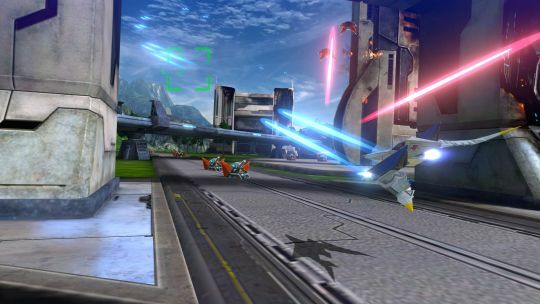 If you didn't know what you were doing then Star Fox will instead send you to a series of much easier levels. This is what I like to call "Self-Selecting Difficulty". The better you play the game the harder it becomes and conversly the worse you play the game the easier it becomes. A quick reminder that Star Fox games always took steps to accommodate players of different skill levels. We can also reverse this reward structure, make it so that the better you are at a game the easier it becomes. For example if you know all the secrets in a game like Super Ghouls 'n Ghosts then you will be able to get better armor faster which makes you stronger and gives you more attack options. Knowing a little more (such as the location of a secret chest) makes the game much easier. Becuase I haven't been able to come up with a better name I'm going to call this "Inverse-Self-Selecting Difficulty" (if you have a better term then please tell me). When you play a game you get better at it. Of course. When I talk about Inverse-Self-Selecting Difficulty I'm not talking about the natural process of getting better at a game but how that game rewards those gains in skill. Self-Selecting difficulty can lessen those gains in skill because any gain in skill is accompanied by an increase in difficulty. A lot of times you get better at a game but don't realize how much better you have gotten unless you go back and play an earlier level and absolutely crush it. You've been getting better the entire time but because the game got harder at roughly the same rate it was hard to get a sense of how much better you had gotten. Inverse-Self-Selecting Difficulty though magnifies those gains in skill. Inverse-Self-Selecting Difficulty is like giving everyone who already has 20 dollars another 10 dollars, or doubling the money everyone has (100->200, 50->100, 0->0). This exaggerates the differences in skill levels between players. Self-Selecting Difficulty though does the opposite, it taxes the best players and gives to the worst. This contracts expressed differences in skill. 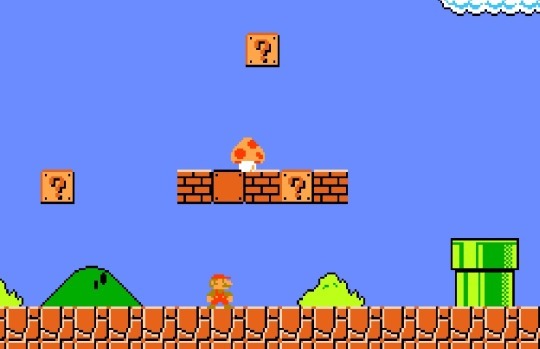 The most famous example of the Inverse-Self-Selecting Difficulty design pattern is probably Mario platformers. In Mario games you don't have health so much as you have upgrades. A mushroom makes you bigger and a special item (such as a fire flower) makes you bigger and gives you a special ability (such as throwing fireballs). Get hit and lose that upgrade. Get hit when you have no upgrades and you die. 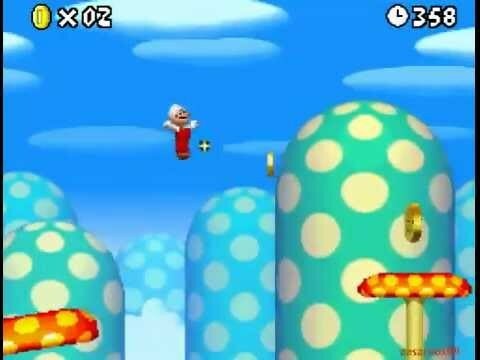 I should note that going from big Mario to small Mario isn't a straight downgrade in the way going from Fire Flower Mario to Big Mario is. This is because when you are Small Mario you have a smaller hit box which makes it easier to avoid attacks and you gain access to some new routes. The better you play the longer you can keep your fancy upgrades that let you fly around, shoot fireballs, or be a cat (truly its own reward). Getting hit doesn't just mean you now can take 1 less hit in the future, it means you lose a very valuable upgrade thus making the game much harder. If you were struggling before you got hit, you are in real trouble now. But looked at from another angle and this means that even mild increases in skill can lead to huge leaps forward in terms of progress. Being able to avoid another attack means that you get to keep that powerful upgrade, keep throwing fireballs, and get a lot further then you could before. Being able to dodge that attack wasn't a huge leap in skill, but it leads to a huge leap forward in terms of progress. 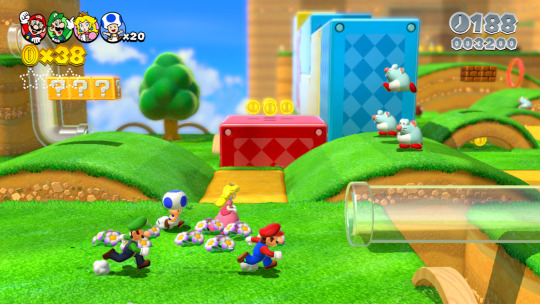 The better you play a Mario game the more power and toys the game gives you. Success is rewarded in a very visceral and pleasing way, with more power. That is part of why playing these games feel so good. Your successes become exaggerated. Getting better is richly rewarded and very apparent. The problem here though is that this makes the game's balance razor thin. The game can feel very easy (boring) right until your first mistake (which is quickly compounded). “Interesting” becomes a very fine line between impossible and boring that is hard to consistently hit. Off topic but one of the great things about the upgrade version of health is that you don't have to have a health bar. How much health the player has is perfectly communicated by the character model which is already where the player's eyes are. This becomes even more helpful when you want to have many players on the same screen. What if we flipped this health-to-power relationship though? What if gaining health lost you those super cool upgrades and losing health got them back? Now when you are at full health the game is at its hardest as you have so few tools for dealing with enemies. But if you screwed up (as the game was setting you up to do) then you are given those super fun abilities. Some players might choose to get hit on purpose in order to get the upgrades. It's a valid strategy if you wish to blaze through the levels but doing so puts you risk of dying because you are only 1 hit away from death. And you could always get hit later if you wanted those upgrades, so what's the rush? 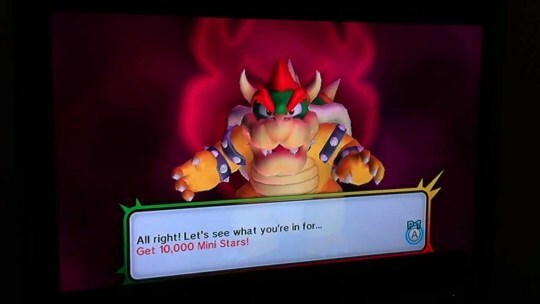 A problem with implementing this system in a Mario game though is that Mario games don't just have enemies that hit you but pits that instantly kill you. You aren't going to always go down to 1 health before you die because of pits. Since upgrades help you avoid the instant kill pits and not just enemies keeping yourself at 1hp becomes a much stronger strategy and so the game is encouraging a much riskier playstyle. Which, actually, some games might want. When played well, the game is at it's most challenging, but when you play poorly the game gives you more tools. The game is designed to try to get you to fail a bit, but not to much. We don't even have to look past Mario in order to see this idea in practice as it is a very prominent part of the Mario Kart series. When you are in the lead and doing well you get the relatively weak and boring items, when you are losing you get the more powerful and exciting items. It is the rubber band effect, the better you play the harsher the game is on you. This makes it so that a group of players with very different levels of skill can be competitive with each other. The problem with the rubber banding effect in games though is that it can frustrate high skill players as skill isn't richly rewarded. In many ways it is even punished as when you do well you miss out on all the fun items in Mario Kart yet still get to be the target of them. It also becomes hard to feel like you are getting better at the game because only large differences in skill are noticeable. Getting better becomes difficult because it becomes harder to tell what is good and what is bad as mistakes are automatically made up for and good plays have a bit taken off the top. With Self-Selecting Difficulty is easy to accommodate a huge swath of skill levels at the same time, but it makes it hard to reward player growth and in many cases punishes it by withholding some of the more fun mechanics. Inverse-Self-Selecting Difficulty rewards skill in fantastic and marvelous ways but because of how this system amplifies those gains in skill these games can have a very fine line between impossible and boringly easy. Both are valuable tools, and whichever one fits each game best is a question of what kind of game it wants to be. The question is what aspects of player growth do you want to magnify and which do you want to dampen?